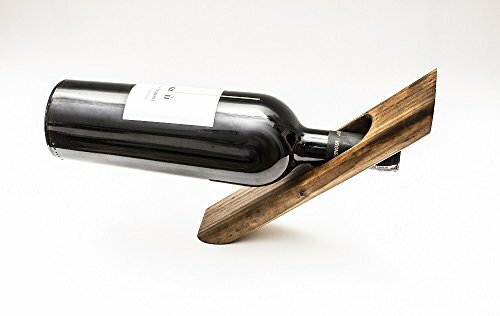 DID YOU TRIED WEEENCA MAGICAL GRAVITY DEFYING WINE BOTTLE STAND? The most magical wine holder your ever seen! Where i could placed a wine holder Weenca? No discussions - 100 % money-back guarantee. Like it or quit it! ORDER IT NOW AND SOON MAGIC WEENCA HOLDER VISIT YOUR HOME! BEST QUALITY MATERIAL Weenca balancing wine holder is produced of high quality ash. Impregnator - organic water-based paint, revealing the real texture of ash, coated with organic lacquer to get mild and glossy finish. BOTTLES SHAPE AND CAPACITY You can place the most popular wine bottles such as the Burgundy bottle, Bordeaux bottle or Alsatian/Mosel bottle into "Weenca" wine holder. A wine holder accommodates a single 750 ml wine bottle. BALANCES WINE BOTTLE IN MID-AIR This unique Weenca wine stand holds the wine bottle in a way that makes it look like it is defying gravity and floating in the air without much support.